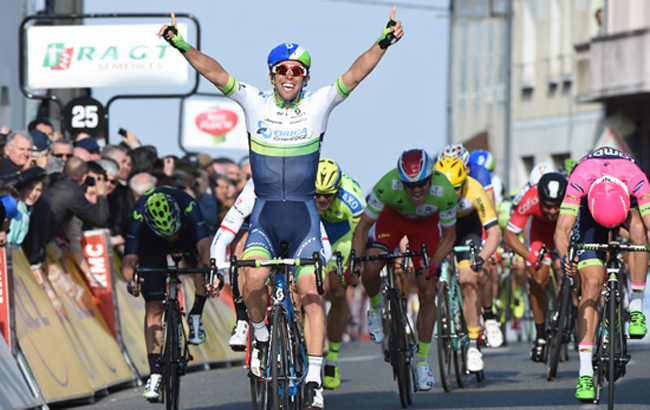 First race of the season, first stage win and first leader's jersey -- Michael Matthews achieved a perfect sweep in the 179-km third stage of Paris-Nice in St Pourcain sur Sioule with much more than a little help form his Orica-Greenedge team-mates. Ideally set up for the final sprint, the 24-year-old Australian delivered in the hilly finale to beat Italians Davide Cimolai (Lampre - Merida) and Giacomo Nizzollo (Trek Factory Racing) and seize the overall lead by the slimmest margin over prologue winner Michal Kwiatkowski (Etixx-Quick Step) and compatriot Rohan Dennis (BMC Racing Team). The break of the day took shape after nine kilometres when Philippe Gilbert (BMC) and Florian Vachon (Bretagne - Seche Environnement) joined forces. The 2012 world champion, a contender for the KOM jersey, and the daily escapee from Bretagne-Seche, were temporarily chased by Antoine Duchesne (Team Europcar) and Bradley Wiggins (Team Sky), who were later reined in. While Vachon collected the bonus on the first intermediate sprint of the day, Gilbert was first at the top of the 3rd category Cote de la Croix du Chene (km 53.5), ahead of Vachon and polka-dot jersey holder Jonathan Hivert (Bretagne - Seche Environnement). 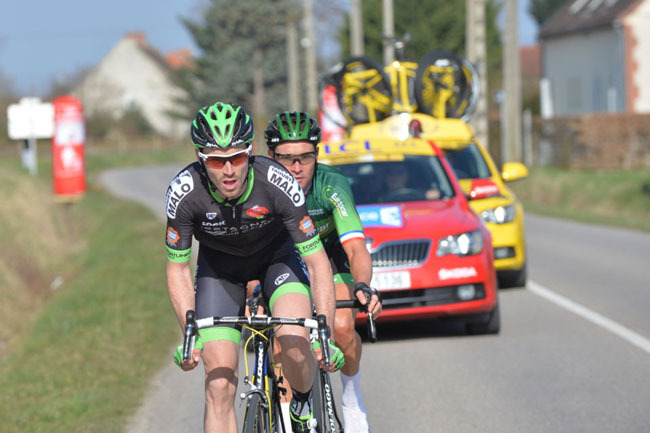 With conflicting interests, Gilbert and Vachon failed to cooperate fully and the bunch came back from 5:20 at best (km 30) to within a minute of the two until Thomas Voeckler (Team Europcar) decided to chase behind them. The Frenchman caught up with the pair at kilometre 74 and the gap increased again to reach 5:15 at the foot of Col de la Bosse (Km 97). 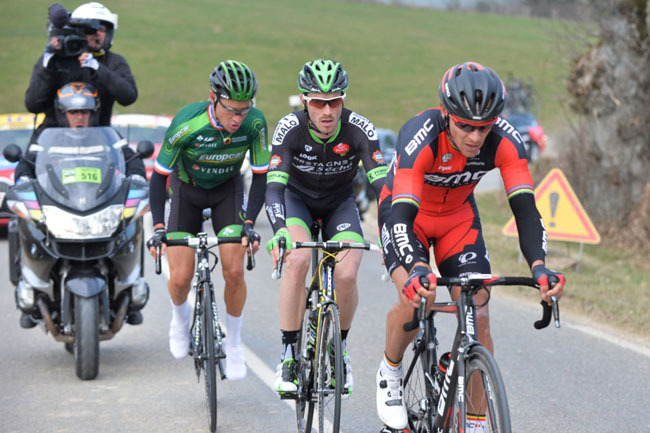 Gilbert did not miss his chance to secure the polka-dot jersey by adding four points to his tally. The last climb of the day, Cote de Vicq (km 117.5) confirmed the trend. The last 50 kms of the stage saw the trio's lead regularly melt down and was down to 30 seconds when they crossed the line for the first time (km 159.5). Vachon picked the three seconds on offer in the second intermediate sprint while Gilbert eased off and let himself back in the bunch. As Vachon and Voeckler lay the arms with 9 kilometres to go, AG2R's Jan Bakelants and Romain Bardet attacked on the heels of Paolo Tiralongo (Astana)). This last ditch attempt was quashed with two kilometers to go when the sprinters trains started to take shape. At this game, Orica-GreenEDGE outclassed the rest of the field. They led the way for the whole finale, placing Michael Matthews ideally in the last turn, when the final hill receded into the last stretch. The other usual suspects were nowhere to be seen. Team Giant Alpecin were unable to place John Degenkolb in contention and only Alexander Kristoff (KAT) salvaged a few more points for his green jersey by finishing fourth. Matthews, the 2010 under-23 world champion, now added yellow to to his jersey collection after holding the Giro's and Vuelta's pink and red garments in recent years. 110 Dominique Rollin (Cofidis, Solutions Credits) all s.t. 114 Heinrich Haussler (Iam Cycling) both s.t. 117 Dylan Van Baarle (Team Cannondale-Garmin) s.t. 120 Christian Meier (Orica GreenEDGE) both s.t. 127 Marcel Sieberg (Lotto-Soudal) both s.t. 131 Thomas Voeckler (Team Europcar) all s.t. 134 Sébastien Chavanel (FDJ) both s.t. 138 Michael Morkov (Tinkoff-Saxo) all s.t. 140 Simon Clarke (Orica GreenEDGE) s.t. 145 Matteo Bono (Lampre - Merida) both s.t. 147 Jacopo Guarnieri (Team Katusha) s.t. 153 Zico Waeytens (Team Giant-Alpecin) s.t. 157 Stijn Vandenbergh (Etixx-Quick Step) s.t. 3 Rohan Dennis (BMC Racing Team) s.t. 7 Sylvain Chavanel (Iam Cycling) s.t. 10 Philippe Gilbert (BMC Racing Team) both s.t. 12 Tejay Van Garderen (BMC Racing Team) s.t. 15 Ruben Plaza Molina (Lampre - Merida) s.t. 20 Tom Jelte Slagter (Team Cannondale-Garmin) all s.t. 23 Rein Taaramae (Astana Pro Team) both s.t. 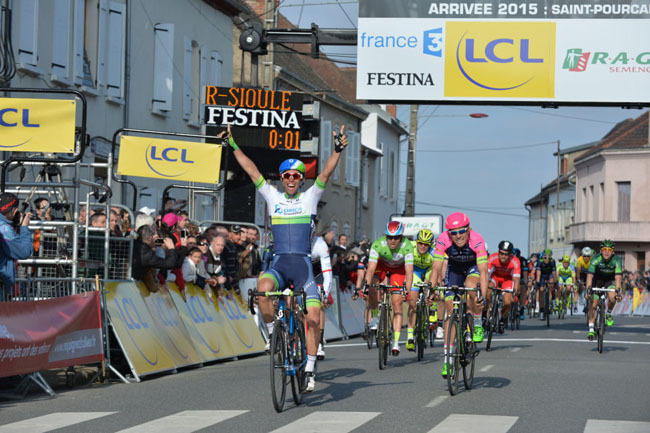 28 Arnaud Demare (FDJ) all s.t. 31 Dries Devenyns (Iam Cycling) both s.t. 34 Florian Senechal (Cofidis, Solutions Credits) s.t. 37 Andrew Talansky (Team Cannondale-Garmin) both s.t. 39 Imanol Erviti (Movistar Team) s.t. 44 Jakob Fuglsang (Astana Pro Team) all s.t. 51 Romain Sicard (Team Europcar) all s.t. 58 Rafael Valls (Lampre - Merida) all s.t. 62 Fabio Aru (Astana Pro Team) both s.t. 65 Robert Kiserlovski (Tinkoff-Saxo) both s.t. 68 Koen De Kort (Team Giant-Alpecin) both s.t. 75 Ben Swift (Team Sky) all s.t. 77 Warren Barguil (Team Giant-Alpecin) s.t. 81 Yury Trofimov (Team Katusha) all s.t. 83 Simon Yates (Orica GreenEDGE) s.t. 85 Dominique Rollin (Cofidis, Solutions Credits) s.t. 87 Moreno Hofland (Team LottoNL - Jumbo) s.t. 90 Vicente Reynes (Iam Cycling) both s.t. 93 Gert Steegmans (Trek Factory Racing) s.t. 96 Paolo Tiralongo (Astana Pro Team) s.t. 101 Julian Alaphilippe (Etixx-Quick Step) all s.t. 103 Mikael Cherel (AG2R La Mondiale) s.t. 105 Michal Golas (Etixx-Quick Step) s.t. 108 Christian Meier (Orica GreenEDGE) s.t. 113 Nikolas Maes (Etixx-Quick Step) s.t. 125 Matteo Bono (Lampre - Merida) s.t. 128 Sébastien Chavanel (FDJ) s.t. 134 Viacheslav Kuznetsov (Team Katusha) s.t. 143 Lars Ytting Bak (Lotto-Soudal) s.t.